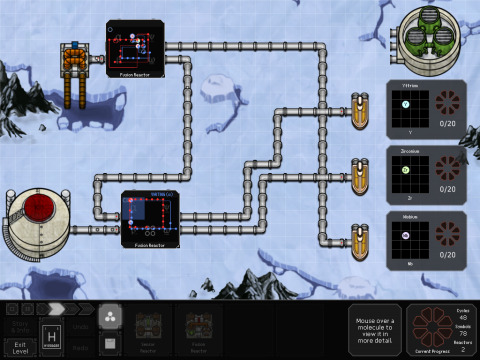 As much mental workout as excellent puzzle game, SpaceChem challenges and entertains, plus it has an engaging story. Do you know what a Waldo is? How about the molecular structure of sodium nitrate? Ethane? No? Me neither. Luckily, that's not really what SpaceChem is about. It's a puzzler about combining atoms to form these molecules, but the emphasis is on the combining, not the molecules. That means creating ever more elaborate circuits, filled with complex instructions, to manufacture the desired substances. That's the theory anyway, and for some that's certainly how it works, as evidenced by the post-level graphs showing where you stand compared to everyone else playing. Each level presents you with base elements that need to be assembled and disassembled to create new molecules. This involves a pair of circuits riddled with inputs that spin, bond, grab and drop the individual elements along with anything they're bonded to. Synching the two separate Waldos (which travel around manipulating the elements) is essential, so that they can work in concert to produce the final product. In practice, that's not exactly what happens. The end result of my levels is a barely working mess. It's a bloated, swollen jumble of lines and nodes that gets the job done, but will probably explode as soon as the level is complete, if only because the machine can only superficially comprehend the mad ravings that I call a solution. This isn't because I understand what I'm supposed to be doing and enjoy the excessively complicated solutions I create. It's more that I can't hold the problem in my mind. It's too big and complex, so I just about flail at the answer, shove a node here, remove a sensor there, and hope it works. Just when I've about got a handle on proceedings, the game throws pipelines and sensors and recyclers and multiple reactors at me. My head explodes, and my chest hits the desk, smoking slightly. This is not a game that's going to make you feel like a quantum genius. No, it will make you feel like a prehistoric ape who's just discovered fire. It treads that fine line between overwhelming complexity and incremental accessibility. When you start a level, the solution looks so far out of reach that you're prone to despair, but since you have to create your solution bit by bit, the whole thing becomes compartmentalised and achievable. That's only going to last so long, though. Unless you've won a Nobel prize, you're going to hit a challenge that's too much for you. The good news is that won't be before you've more than got your money's worth out of SpaceChem. The bad news is that you're never going to find out what happens at the end of the really quite-good story, which unfolds in the form of between-level narrative vignettes. But in the state your brain will be by then, I doubt you'd be able to comprehend anything beyond monosyllabic commands anyway.